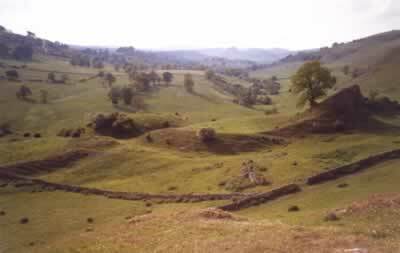 Pilsbury Castle is an 11th century earthwork motte and triple bailey fortress, probably founded by Henry de Ferrers. The large flat-topped motte, is encased by a wide ditch and the eastern bailey, is defended by a steep-sided limestone reef, which is crowned by an unusual high outcrop and the foundations of a narrow, rubble wall. The southern bailey which has been damaged by ploughing, is defended by a low encasing rampart and ditch. Standing against the flood plain of the River Dove, by the end of the 12th century the castle had probably been abandoned. 8 miles north-east Bakewell Castle and 10 miles east is Haddon Hall. Pilsbury Castle is located north-west of Pilsbury, off the A515. 26 miles south-west of Sheffield, on the A621-A619-B5055. A public footpath passes the castle from the road and there is concessionary access to the site, check website for details.